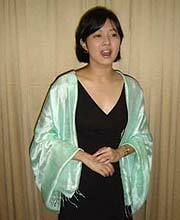 Doreen is the Choir Director at Petaling Jaya Evangelical Free Church (PJEFC). In May 2003, she performed lead vocals with the Canticle Singers for several songs at The Rose of Sharon, a contemporary Oratario. Her recording break came she caught the attention of Prody G, an Orchestral Director at the Tabernacle of David. In Prody G's recent album entitled Lamb of God, Doreen performed lead vocals for 6 songs, namely Lamb of God, El Shaddai, Worthy is the Lamb, I will trust in You, Both riches and honor, Kasih Syurga. Her powerful and distinctive voice contributed greatly to the album. Doreen has also made her way into several secular musicals. She played lead roles in M the Opera and Tunku, the Musical.